Dupaco uses a multitude of ways to communicate directly with members, including U.S. mail, phone, e-mail, messages within Shine Online Banking, and more. In our world today, fraud is a pervasive problem. It's very easy to create a website that looks legitimate; easy to impersonate a call coming from a familiar business or organization; easy to produce a convincing e-mail. The bottom line is that it's easy to fall into a trap and unknowingly provide personal and financial information to criminals. Will NEVER solicit you and ask for your member or account numbers, or online banking credentials such as user name or password. Will NEVER utilize internet browser pop-ups or advertisements that request you to enter financial information or login credentials. Will NEVER contact you and ask for your credit or debit card number, personal identification number (PIN), or 3-digit security code. If you are ever concerned about the legitimacy of communication that appears to be from Dupaco, do not provide any information, and instead contact Dupaco directly to inquire about the communication. Dupaco regularly will ask for your opinion on how well Dupaco is taking care of you and your family. These e-mails contain a link and request generic, non-financial information from the recipient. 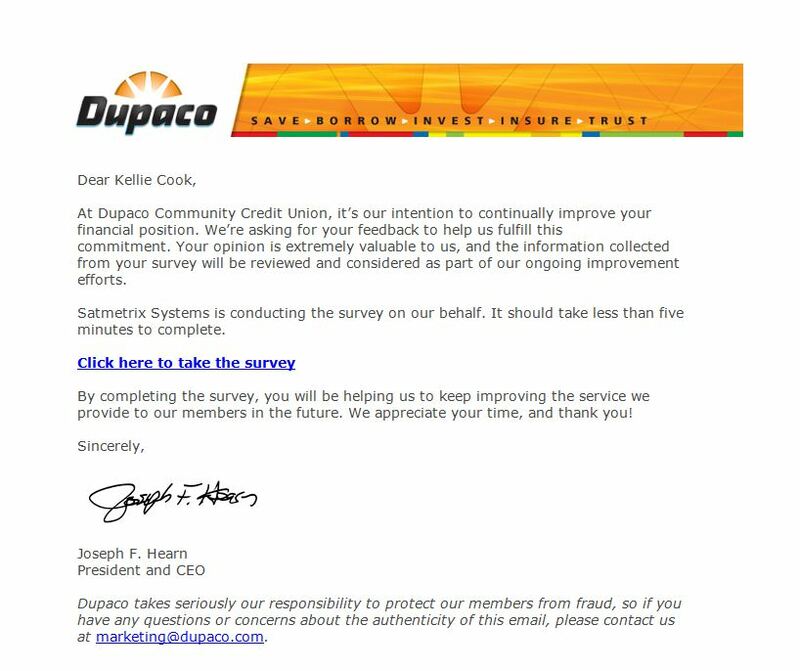 Surveys may request feedback on Dupaco services or be triggered by a specific transaction completed in person, by phone, or online with Dupaco within the last week. Your feedback will help us meet our goal of being the best financial institution you’ve ever experienced! (Note: We will never ask you for your account number, SSN, or password in a survey!) View a sample survey e-mail.